NARAKU replacement piston set for 47mm cylinders. The piston has a CNC-machined oil grooves for enhanced lubrication at the piston skirt. The piston skirt has a special molybdenum coating for the all-important running-in period. 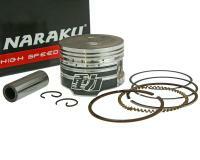 Suitable for 47mm V.2 NARAKU GY6 139QMB/QMA cylinder kits and Kymco 4-strokes. 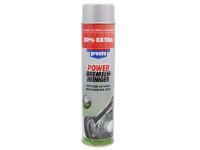 Delivery includes piston rings 1 and 2 oil scraper rings, gudgeon pin and circlips.